We are also planning a trip to a local wind tunnel to test our wings. This is for the purpose of correlating our CFD data to wind tunnel data to further our understanding and abilities internally. We're pretty excited! 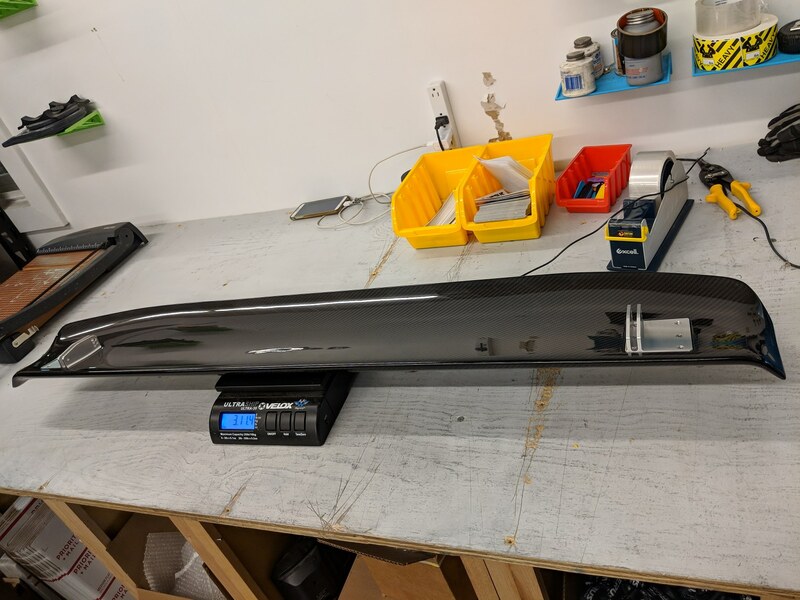 Below is a photo of our 300mm chord unit, we will also be testing our smaller FRS/BRZ wing as well. We'll be sharing the data here as well as some photos and maybe a video? I was doing some work with our wing this week, testing out a new application with prototype parts and figured I would grab some weights! The wing without any mounts on it is 3lbs 1oz. The wing with similar mounts as the twins is 3lbs 11oz. Our Japanese distributor also asked us to create an upright assembly for display purposes so I grabbed a quick photo before shipping. 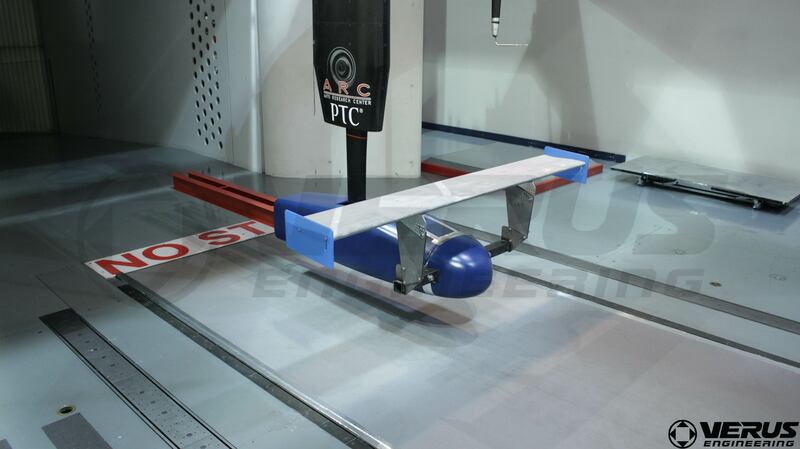 There is a decent bit to this mounting system to ensure the trunk does not deform and can handle the load (300 lbs) the rear wing can produce. "hey look! A new Ferrari!" So we did end up going to the wind tunnel to correlate our CFD data to what is seen in the real world. We are still going through the data recorded at the tunnel as it just happened a few days ago, but when we have the data to share we will share it! In the meantime here are some photos. The carbon unit is our 300mm chord single element unit which we already produce. 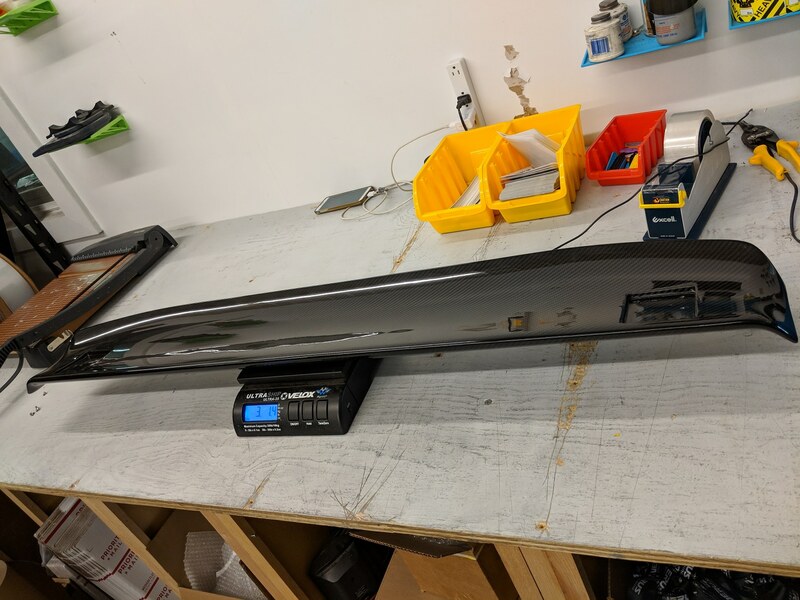 This is the same profile used in our FRS/BRZ wing; the FRS/BRZ wing is a 3D shaped wing though vs. this unit being a 2d profile. The 3D printed unit is possibly the 250mm chord that we may bring to market down the road. Both profiles were developed by us and are our own profiles. Your efforts are really impressive. I also believe that the wing is really good. I just wished that it wouldn't look so weird. I am still not ready to sacrifice the looks of my car although I would love the downforce. Because, I think it looks Absolutely BEAUTIFUL! We are working on revising the mounting to the trunk as it is what we have heard does not look nice. Being engineers; we do not have the best eye for aesthetics at times. We see things like weight, stress risers, good load transfer, etc. I would expect to see another version of the mounting to be released around spring. We appreciate that! But the general consensus is that the bottom of the mounting is not aesthetic so we are working on a revision. I will work on getting our data from the wind tunnel posted in here shortly. I'm with the majority on this. The shape of the wing itself looks fine, the mounts are ugly. Or more accurately, the placement of the mounts. Swan neck mounts always look kinda wonky but the forward minting just looks weird. IMO the farther back you can go the better. 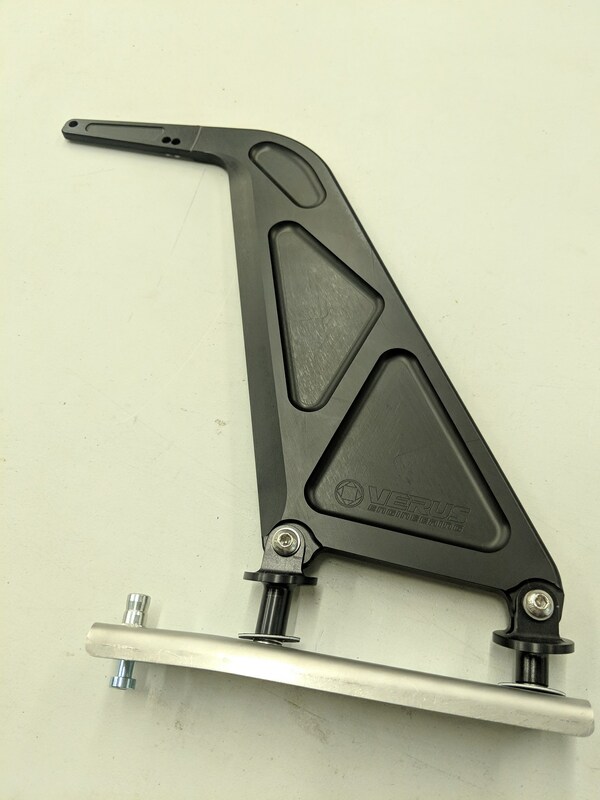 Personally, I look the Rocket Bunny v1 mounting. Keeps the top of the trunk clean and adds a little business to the back. Plus the angle flows well with the trunk lines. Maybe a reverse swan neck with a rear edge mount is possible? At what speed is the added downforce noticeable in a turn like, say 8 and 9 at Big Willow? Thank you. 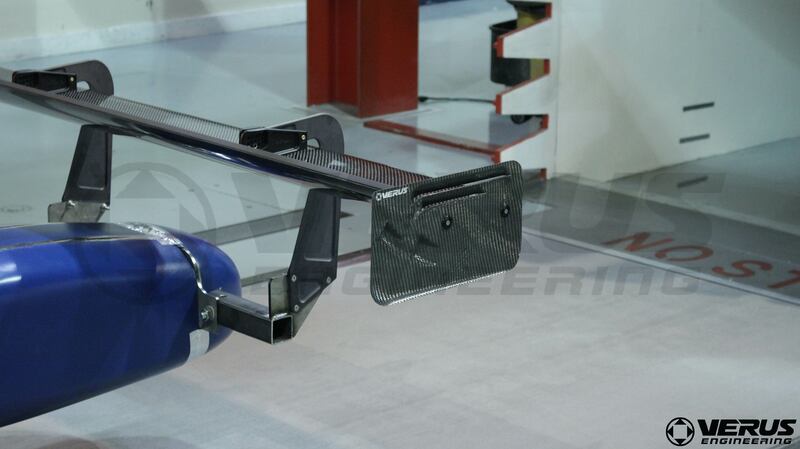 I agree that the mounting is probably what makes the wing looking less "clean" than, for example, the R Magic Wing or even the Nur Spec Wing. In particular, the combination of the oem spoiler and the Verus wing doesn't look clean or stock-like (although the effectiveness seems to be great). The location stays, unfortunately. It is a very strong part of the trunk and allows the load to transfer through the trunk well which is unlike most other wings on the market. Downforce works at all speeds, but what is noticeable to one person is not noticeable to another so that is a difficult question to answer. At approximately 50MPH the rear wing makes about 50 lbs of downforce, and at 100MPH, 150 lbs, and 150MPH, over 300 lbs. I hope that helps some but if you have further questions please ask. 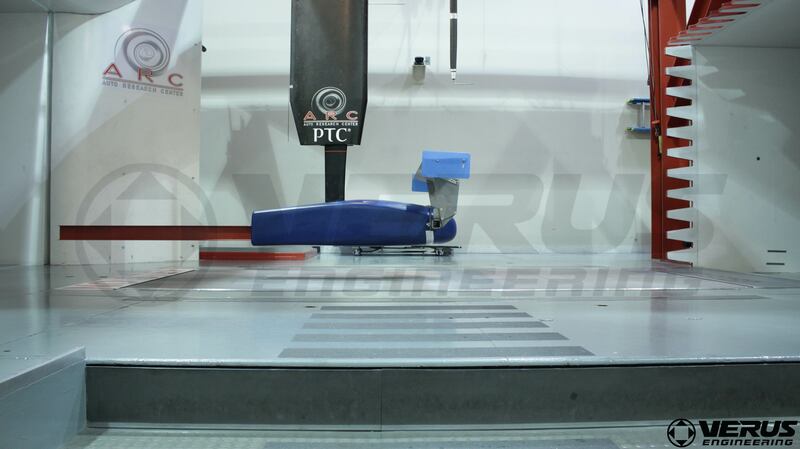 A few weeks ago, Verus went to the wind tunnel with the goal of validating our CFD analysis. 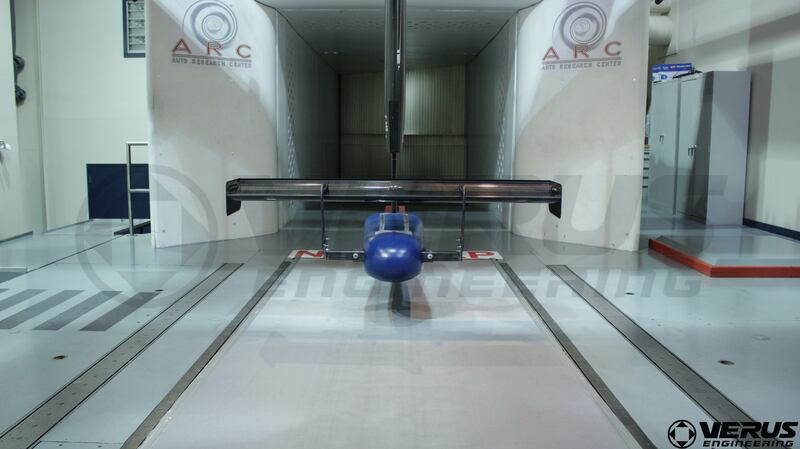 We tested at Auto Research Center Indianapolis (ARC Indy) using their wind tunnel for full-scale wing testing. Two of our rear wings were tested, along with 4 other wings from various other small businesses/privateers, using fixtures designed and built in house. 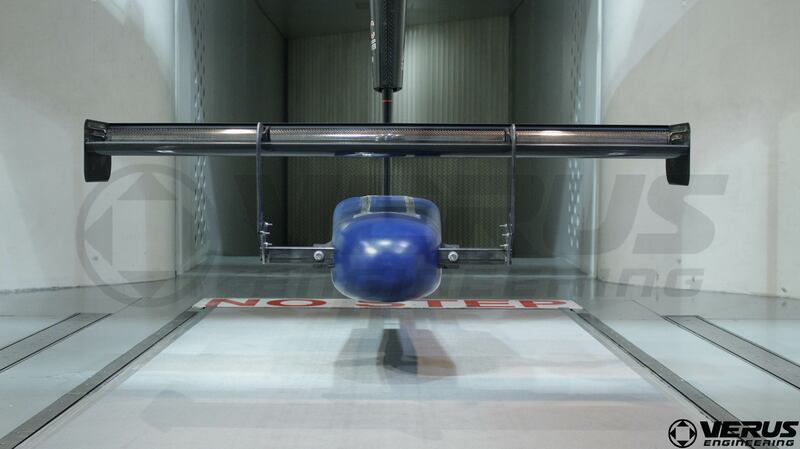 Today’s blog will go over our results and findings from the wind tunnel. 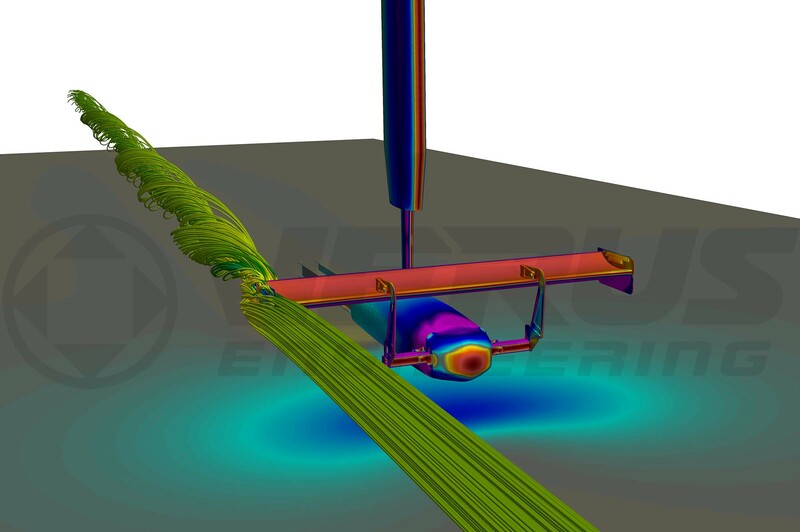 Validating our CFD to wind tunnel data ensures that our test procedures within CFD are accurate and reasonable. CFD can run incorrectly very easily, and we wanted to make certain that our results within CFD estimate real world numbers. How Did We Run CFD to Compare to the Wind Tunnel? Unfortunately, it is physically impossible to test a rear wing in free-stream, which is how we developed our wing profile. The wing needs a way to be held up in the wind tunnel; so to correlate our results from CFD to the wind tunnel; we had to model and CFD the entire sting at the correct height off the tunnel floor. The wind tunnel tests were ran at ~80 MPH or 36.5 meters per second. 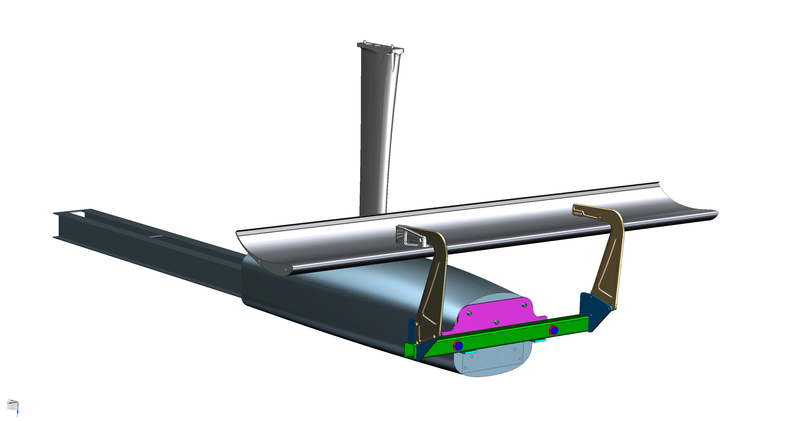 Mesh generation, analysis, and post processing was handled by ANSYS. The mesh for this run was a bit over 40 million cells. The wing had 20 prism layers with a first cell height of 0.005mm to capture the viscous sublayer. We ran the wing through our main (3) turbulence models, K-Omega SST, K-Epsilon Realizable, and Spalart-Allmaras. We primarily use K-Omega SST in our analysis; but, presented a chance to improve our processes, we tested three. The graph below shows downforce for the experimental data (wind tunnel) compared to our CFD with different turbulence models applied. The analysis using the K-omega SST turbulence model was the closest to the wind tunnel results. 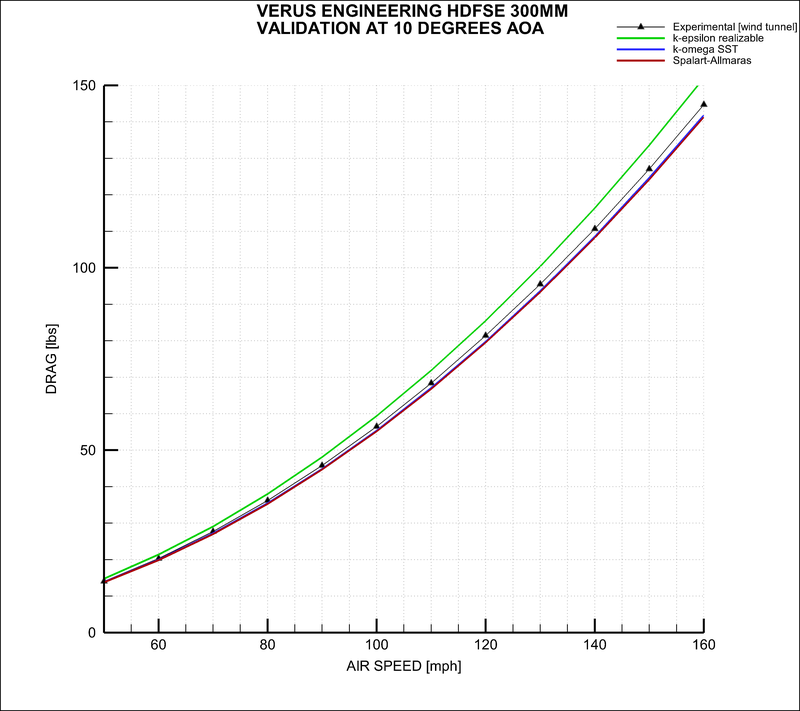 Comparing this data; our CFD analysis underestimated downforce by 3.4lbs at 80 MPH; 7.5lbs at 120 MPH, and 13.4lbs at 160 MPH. The graph below shows drag for the experimental data (wind tunnel) compared to our CFD with the same turbulence models above. The analysis using the K-Omega SST turbulence model was again the closest to the wind tunnel results. 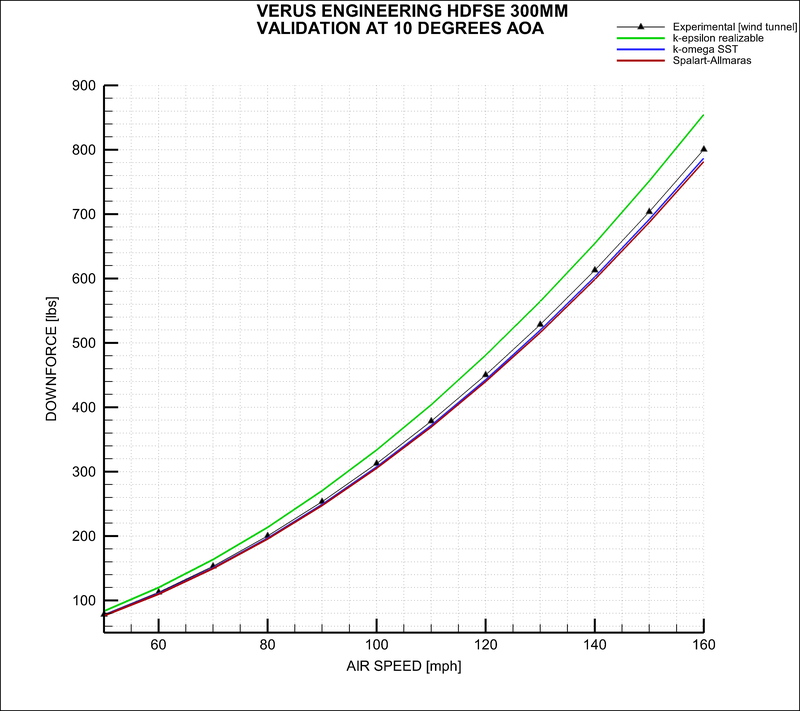 Comparing this data, our CFD analysis underestimated drag by 0.7lbs at 80MPH, 1.6lbs at 120 MPH, and 2.8lbs at 160 MPH. The below spreadsheet shows the downforce and drag coefficients for each simulation; with the percentage difference between the CFD analysis and the wind tunnel results. With under a 2% difference from our CFD analysis to the wind tunnel; we are ecstatic with the results correlating so well. This really helped us solidify our analysis procedure and ensure what we do for each analysis is indeed correct and correlated to real-world results.